Our second day in Munich started by travelling back to the central station and catching the train to Füssen. 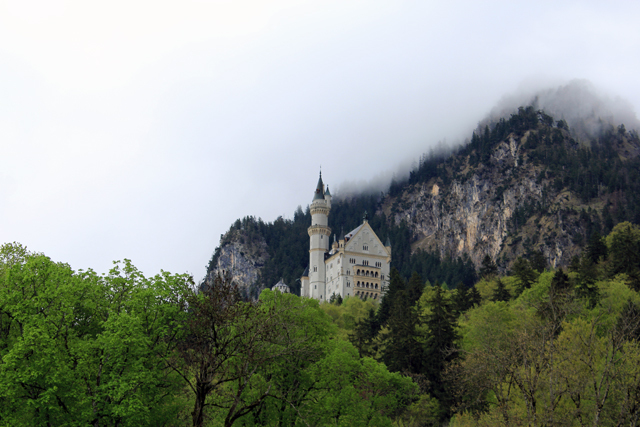 I was so ridiculously excited because we were off to go and see Schloss Neuschwanstein and Schloss Hohenschwangau, two stunningly beautiful Bavarian castles. The train took about two hours, during half of which we were pretty concerned as rain was absolutely bucketing it down. It was really interesting being able to see so much of the Bavarian countryside and all of the gorgeous and quaint architecture. We even saw hare, deer and birds of prey. 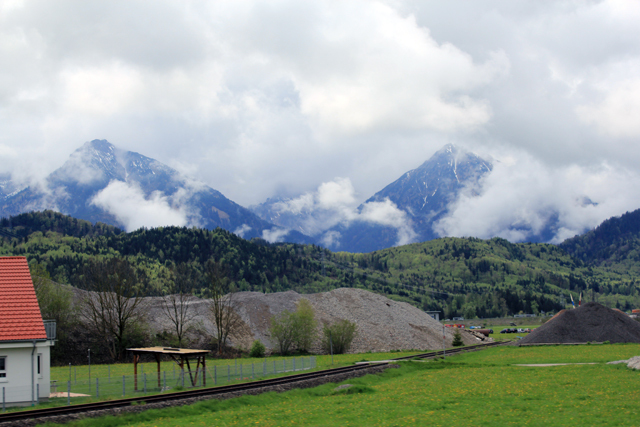 As the alps became visible, the rain passed and we were greeted to stunning views from the train. 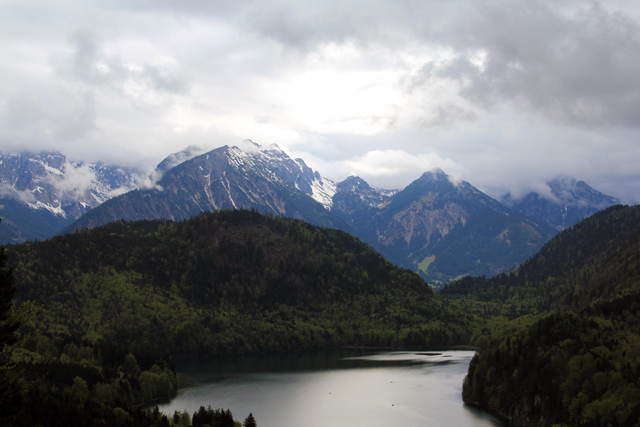 We got a bus up to Schwangau and started our ascent. We decided to queue up to get tickets to go inside the castles, only to be told after about ten minutes of very slow queueing, that they were all sold out for the day. I would say that if you have your heart set on looking inside the castles, you should book online for sure. 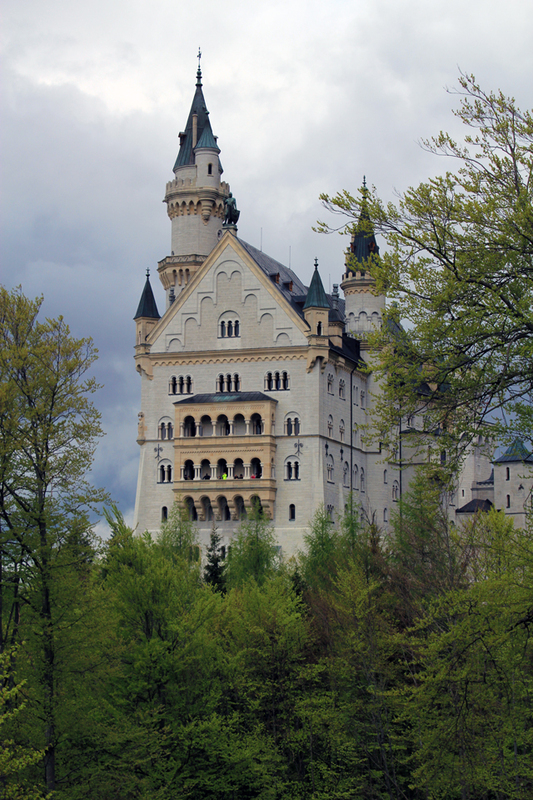 Without getting disgruntled, we set off to walk up to Neuschwanstein. You can get a horse drawn cart up the mountain, but it isn't that hard a climb by any means! 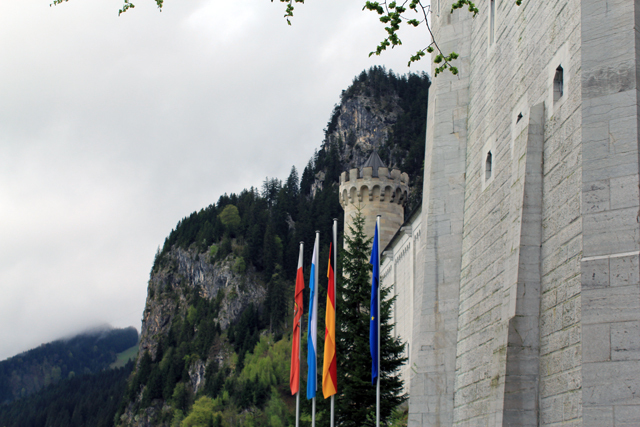 As we arrived at the castle, we were completely taken away by how beautiful everything was. Despite not being able to go inside (even though you can't take photos and are kind of treated a bit like herded cattle), we were able to look in the courtyard and all around the grounds. We hadn't done too much research prior to our trip, so were pleasantly surprised to find some really beautiful walks. I also wouldn't recommend you do them in the order we did, as we ended up doing twice as much walking and climbing as we should have, but you'll see why. 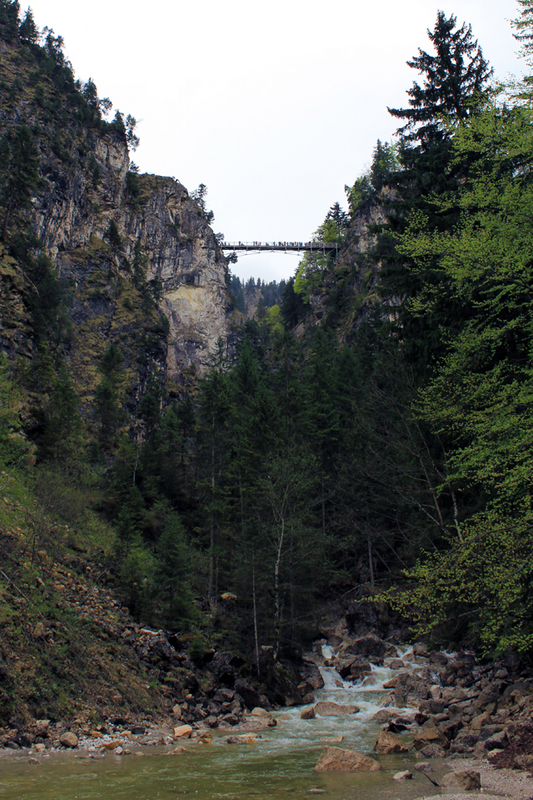 After taking in the castle close up, we descended down steep steps along the river which flows beside it and an amazing view of the bridge that crosses the gorge called Marienbrücke (Mary's Bridge). As we continued our descent, the path and steps became a raised metal platform that hugged the huge boulders of the mountain to our left and passed over the gushing river below. Not the best experience for someone with a fear of heights, as the platform wasn't always completely flush to the mountain and there were sometimes gaps of at least a foot or so, with no hand rails. Not to be put off, we carried on enthusiastically, some more than others! When we reached the bottom, it occurred to us that if we were to go on the bridge, we would have to turn around and go back the way we came. Fortunately, it is the sort of place that is so stunning that just turning around gives a whole new and beautiful vantage point. Eventually we reached the top and tentatively I made my way onto Marienbrücke, trying not to think about the 300 foot (90m) drop. It really is quite an experience unlike anything I've had before. 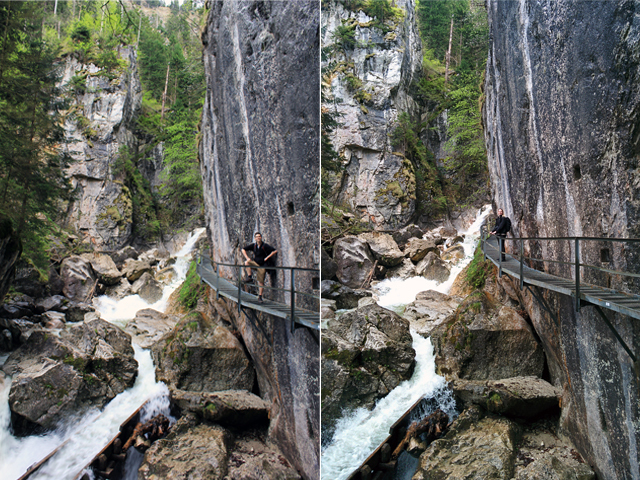 The bridge is narrow and the base of it is made of wooden planks which buckle under the masses of crowds trying to get a picture of Schloss Neuschwanstein. I did my very very best not to cry, which is my usual response to heights (and beautiful views it seems). Despite my own personal issues, it really is an incredible view and definitely worth the height-induced stress! I've read that there is a bus that takes you straight to the bridge, if you don't fancy the climb up. We walked back down the mountain, stopping at some breath-taking panoramic viewpoints. 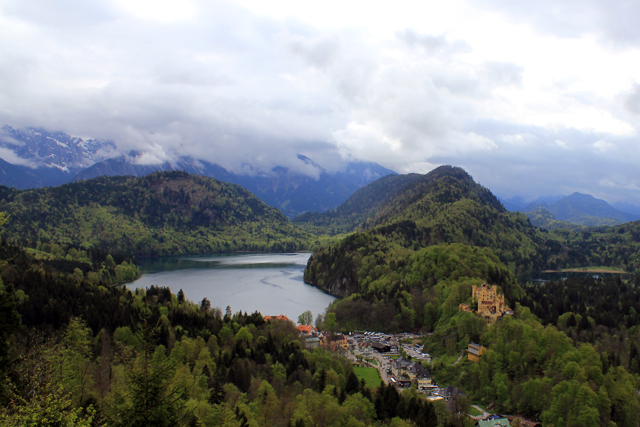 We then decided that we were too tired to visit Hohenschwangau, so we got the bus and then caught the train back to Munich. Munich at night had quite a buzz and again, there was quite a bit of street music going on. We caught a bit of this one performance before we made our way back to our room to crash out. They were brilliant musicians and got the whole crowd involved. 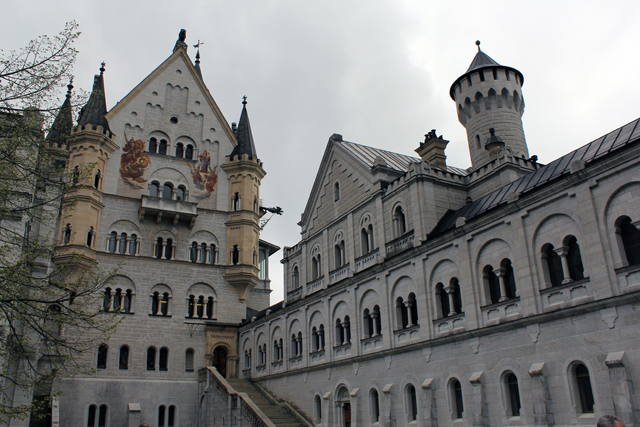 Our trip to Neuschwanstein was one I will definitely treasure forever and I would highly recommend it. This looks amazing! 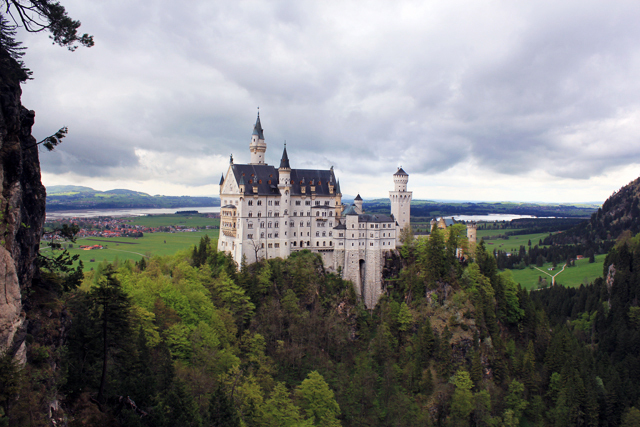 I really want to visit the Neuschwanstein Castle. It's incredibly beautiful!